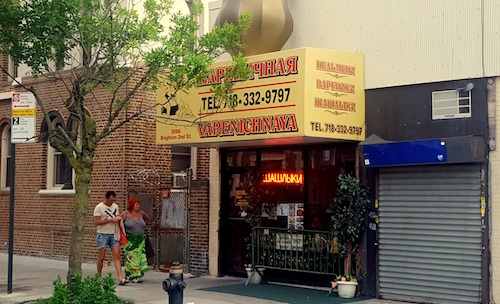 Russian restaurants are ubiquitous in certain parts of New York City, and Brighton Beach may set the standard for the community. Varenichnaya attracted me a little more than others around because of its name which set it up as the makers of Russian dumplings called vareniki. They have a full menu and also span a range of Uzbek dishes, but I came to try dumplings of all varieties. Both the mushrooms & potatoes vareniki ($6.95) and fried cabbage vareniki ($6.50, below) are solid first courses, bite-size dumplings that are slimy with grease and covered with some sauteed onions. I could not resist ordering a portion of the pelmeni Siberian meat dumplings ($6.50, below) either. These roundish dumplings are little morsels of pleasure, juicy and meaty. Not to be served without sour cream. As the Russian variety shows played on the big screens and our stomachs started the process of digestion, we decided to look towards the kebab section and order an Uzbek-style lula kebab ($3.95, below), ground lamb with plenty of spices. It comes very simply on a skewer with a few raw onions if you choose. I added the hot sauce that accompanies each table, which complements the meat very nicely. All in all though, the kebab is not as tasty as it is in Uzbek restaurants, and I suspect that the soups like lagman and shurpa are similarly lackluster. And then why not have dessert? The vareniki with cherry ($6.95, below) is not necessarily a dish served for dessert, but it is topped with sugar and comes with a syrupy cherry sauce. It seems natural to order this last and end on a sweet note. This is my new fave restaurant for dumplings or some beef stroganoff. I was searching for Russian cuisine on a website< City Maps, I read about in NY Mag. I tried a few that were relatively close to my apartment, but this is definitely my favorite. The website is pretty cool too!